Identifying a valid claim to the Melchisedec Priesthood is essential to finding the gate into the kingdom of God. There are essentially three Strangite groups that claim the Melchisedec Priesthood today. The leaders of these groups are: (1) Vernon Swift (deceased), (2) Samuel E. West, and (3) John Hajicek. There are others within each group; but, the priesthood in each group depends on the validity of the primary person. Identifying a valid claim to the Melchisedec Priesthood is essential to finding the gate into the kingdom of God. There are essentially three Strangite groups that claim the Melchisedec Priesthood today. The leaders of these groups are: (1) Vernon Swift, (2) Samuel E. West, and (3) John Hajicek. There are others within each group; but, the priesthood in each group depends on the validity of the primary person. The importance of this priesthood can be appreciated by considering how Jesus organized the kingdom on earth. “11 And he gave some, apostles; and some, prophets; and some, evangelists [high priests]; and some, pastors [elders] and teachers; 12 For the perfecting of the saints, for the work of the ministry, for the edifying of the body of Christ: 13 Till we all come in the unity of the faith, and of the knowledge of the Son of God, unto a perfect man, unto the measure of the stature of the fullness of Christ.” (Eph. 4) This priesthood is “for the perfecting of the saints,” and “for the work of the ministry.” This organization is to remain “till we all come in the unity of the faith;” whenever the kingdom is fully organized on the earth. Without an officer of this priesthood none can be perfected (born of water and the Spirit). As the gospel was to be taken for 1,260 years, it is logical that at the end of the 1,260 years the Melchisedec Priesthood and gospel would again be returned to the earth. “6 And I saw another angel fly in the midst of heaven, having the everlasting gospel to preach unto them that dwell on the earth, and to every nation, and kindred, and tongue, and people.” (Rev. 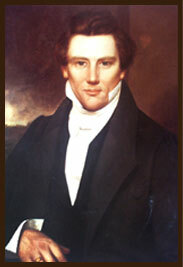 14) Exactly 1,260 years later, on April 6, 1830, Joseph Smith organized the Church of Christ, claiming to have received the same office of the Melchisedec Priesthood as Moses, Jesus, and others, was given a correct understanding of God and Jesus, and restored both the priesthood and the gospel. If his claims were false, there is still no hope for man to enter the kingdom of God. Through Joseph the latter day saints received a correct understanding of God, Jesus, the gospel, and the laws of God. When they failed to abide by the will and laws of God, they were driven from Independence, Missouri, under an Extermination Order given by the Governor based solely on religious discrimination. Many of the saints were killed and all were driven from their homes in the middle of winter. The devout life style of the latter day saints caused difficulty with the lower class of people that inhabited the frontier lands. God established Nauvoo, Illinois as the next gathering place for the latter day saints. It was very successful at the beginning; but, the saints failed in many respects to abide in the commandments they were given. Joseph Smith was taken on June 27, 1844 . At the death of Joseph Smith, the church divided into three primary groups: (1) Strangites, (2) Twelvites, and (3) Rigdonites. Joseph Smith was given four revelations that in the event of his impending death that he would appoint “another” to succeed him. “4 But verily, verily, I say unto you, that none else shall be appointed unto this gift except it be through him; for if it be taken from him he shall not have power except to appoint another in his stead. 5 And this shall be a law unto you, that ye receive not the teachings of any that shall come before you as revelations or commandments; 6 And this I give unto you that you may not be deceived, that you may know they are not of me. 7 For verily I say unto you, that he that is ordained of me shall come in at the gate and be ordained as I have told you before, to teach those revelations which you have received and shall receive through him whom I have appointed.” (Utah Doctrine and Covenants, 43) A full exposition of the claims of James J. Strang and Brigham Young are contained in The Prophetic Controversy and LDS Prophets pages. On June 18, 1844 , about ten days before his death, Joseph provided his last revelation—the Letter of Appointment—in which he appointed James J. Strang of Burlington , Wisconsin , as his legal successor. This letter is now in Yale University Library. The same hour that Joseph was murdered in Carthage Jail, James J. Strang claimed to have been ordained under the hands of angel(s) in accordance with the law of God; as Joseph’s successor in the office of first degree Apostle, Prophet, and Lawgiver (although 400 miles away). James made this event common knowledge the same night. ONLY James J. Strang fulfilled both parts of the law. He was called directly by Joseph and was ordained under the hand(s) of angels. ONLY James J. Strang fulfilled all of the duties of a Prophet, Seer, Revelator and Translator. On there way to California, Brigham called a conference on December 25, 1847, in Council Bluffs, Iowa. The conference admitted that James’ claim (that the Church of Christ cannot stand without a Prophet at its head) was true. God had never called, nor was Brigham ever ordained to any office higher than the lower third degree apostolic office of the Twelve. The law of God provides the Twelve can act only under the direction of the Presidency. Their mission was to the nations of the world. Sidney Rigdon held the next lower office below that of Joseph as second degree Apostle and Counselor. He would have had a legitimate claim to stand at the head, if God had not already called James J. Strang to a higher office and as head of the people. His followers divided and most followed Bickerton. Several of the Twelve tried to get together and have a meeting to pray and discover the will of God. On Feb. 10, 1857, five of the Apostles were able to meet in the wilderness 6 miles from Racine, Wisconsin, “and there prayed and communed with each other all night. We became satisfied, that the Twelve could not lead the Church without a Prophet; and concluded to take care of ourselves and families.” (Ibid, p. 45) The church divided into numerous branches from Colorado to Michigan. There were missionary efforts especially in the early 1900’s by such men as Samuel Martin, Ben T. Short, Edward Couch, Lloyd and Hallie Flanders, and others. They were able to establish liaison and communication between the branches; and enlarge the membership several fold. At a 1955 church conference, the people voted (17 to 16) for Vernon D. Swift to preside over them. There is no evidence that he either believed in or conducted any missionary work. He said at a conference that he believed the gathering was a true doctrine; but, that he never had any feeling to gather. The lambs usually follow the sheep. He stated that he felt the gathering was a true doctrine of the church; but, that he had no personal feeling to gather (he had an established business in Artesia, New Mexico). Once a law of God is established it not necessary for God to personally address each person. There were attempts to gather the people to one location; even under the Apostles but none were entirely successful. “17 Wherefore come out from among them, and be ye separate, saith the Lord, and touch not the unclean thing; and I will receive you, 18 And will be a Father unto you, and ye shall be my sons and daughters, saith the Lord Almighty.” (2 Cor. 6) Stephen West felt the only remaining place to gather was Voree; as the saints were never persecuted there and James maintained property interests there until his death. He moved his family there in 1947. Only a few others followed. Then, in 1961, a most catastrophic event took place. The church has both a civil and a spiritual identity. The civil identity of the church was incorporated under Joseph Smith; but, only for the purpose of handling property. Joseph was Trustee in Trust. Under the leadership of Vernon D. Swift, the people reorganized the spiritual church into a corporation in 1961. Under New Mexico law, Vernon became the President of the new church. When an organization incorporates, it loses its original identity. The Swift church could no longer represent the original spiritual church organized by Joseph Smith and continued by James J. Strang. Their Certificate of Incorporation actually states that, “it has absolutely no connection, ties, agency or affiliation with any other religious body.” It was now solely a part of the U. S. Government. As if this was not sufficiently evil, they organized a new order of the priesthood to stand at the head of their church—a Ruling Council of high priests. The lowest office the law of God provides to stand at the head is that of second degree Apostle and Counselor. In writing about the office of second degree Apostle and Counselor James noted, “If there was an interregnum in the Priesthood of Lawgiver, the oldest Apostle of this Degree… would stand at the head till the place was filled.” (Ibid, p. 219) Not even third degree Apostles hold authority to stand at the head; and certainly not High Priests. The Prophet James wrote of High Priests, “All inferior Kings, Patriarchs, or heads of tribes, and Nobles, or heads of clans, ought to be of this Priesthood” (Book of the Law, p. 224). They cannot stand in an office that third degree Apostles (the Twelve) hold. In addition, they used the corporate by-laws as the Constitution of their new church–establishing man-made spiritual laws to govern them. The Prophet James wrote, “1. From time immemorial the Constitution of God’s Kingdom has been entitled, ‘The Decalogue,’ or, the ‘Ten Commandments.’” (Book of the Law, p. 38) Vernon must have considered himself much wiser. The people were told for decades that the corporation had nothing to due with the spiritual church. Everyone should have recognized the deception; as they tried to use the Ruling Council to rule their church and used the corporate Constitution to govern their church. The first person to recognize the evil of this act was Lloyd A. Flanders, High Priest. He had presided over the Strangites from 1947 to 1955. Many of the saints depended on him for spiritual guidance. His letters and writings are still treasured today. On February 12, 1967 , he wrote Vernon, “…for as noted in my letter to you before: if we make the Ruling Council anything else but a Temporary High Council: we have set a man-made head on the Church: and are no better than other L.D.S. Bodies.” On November 25, 1969 , he wrote Vernon again, “I regret ever having had the slightest thing to do with the charter for the Church: I regard it is a serious mistake ON MY PART: and I have repented of it and asked God’s forgiveness.” Vernon never made these letters public. They were found in the files of Lloyd Flanders after his death. Vernon Swift would not heed the words of this High Priest who had labored in the ministry for forty-three years. At his 2000 General Conference (for the benefit of the corporation), Vernon made it clear that the church was ONLY a corporation, “the corporation church and the spiritual church are all the same thing, THEY’RE ALL THE SAME THING.” (General Conference Minutes, p. 28) He was partly correct. They were the same thing: simply a civil organization (the spiritual was lost). Shortly before this conference I had a private investigator examine the church records. The ONLY records that could be provided by Vernon were those of the corporation. The members and priesthood of the corporation are ONLY appendages of the corporation and exist ONLY as a part of the U. S. Government. 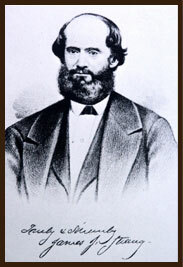 Theron Drew, in Burlington, Wisconsin, also recognized that the mainstream church no longer represented the church organized by Joseph Smith. His group has been known as the Drewites. He died and was succeeded as leader of that group by his son Richard. Richard is also dead. There does not appear to be anyone left in that group. There appears to be only two remaining groups that could have a legitimate claim to the original line of Melchisedec Priesthood through James J. Strang: (1) Samuel E. West in Shreveport, Louisiana; and (2) John Hajicek in Independence, Missouri. John Hajicek claims his priesthood through an ordination to the office of Elder by Steve Barany. Barany had been ordained an Elder by Joseph Hickey, who had been ordained an Elder by Wingfield Watson, who had been ordained a High Priest by L. D. Hickey. John Hajicek believes that Utah D&C 20:67 invalidates the ordinations to High Priest of Wingfield Watson, Samuel Martin, and others. “67 Every president of the high priesthood (or presiding elder), bishop, high councilor, and high priest, is to be ordained by the direction of a high council or general conference.” Verses 65 – 67 were not a part of the original Articles and Covenants of the Church of Christ, given in Fayette, New York, June, 1830. It is believed they were added by Oliver Cowdery and included in the 1835 Doctrine and Covenants. Verse 67 was simply a rule of man to exist until modified or eliminated. The original organization with its Presidency, High Council, and general conferences ended with the death of James J. Strang on July 9, 1856. Thus, this organizational rule no longer applied; as there was no High Council and no Presidency to call a general conference. The Twelve Apostles under James never made an attempt to call a general conference. The first presumed general conference was called in 1919, evidently by Wingfield Watson. Wingfield Watson had been ordained a High Priest by Apostle L. D. Hickey on April 18, 1897. Watson wrote “He [L. D. Hickey] knew the people and said I was their choice and said if I would go down to Coldwater he would ordain me. I went and was ordained by him and have been taken as its president every since.” There are two serious flaws in this ordination. First, the voice of the people is not the voice of the Lord. “1. The Lord your God will choose faithful men, keepers of his Law, examples in righteousness, to be Priests of the order of an endless life.” (Book of the Law, p. 193) “4 And no man taketh this honour unto himself, but he that is called of God, as was Aaron.” (Heb. 5) All men must be called by the spirit of prophecy to the priesthood. Second, Watson could not stand at the head of church. The Twelve Apostles agreed they did not hold an office high enough to stand at the head. The stream cannot rise higher than its source. No Apostle or High Priest can stand in royal authority without the Presidency. “10 High priests after the order of the Melchizedek Priesthood have a right to officiate in their own standing, under the direction of the presidency, in administering spiritual things, and also in the office of an elder, priest (of the Levitical order), teacher, deacon, and member.” (Utah D&C 107) L. D. Hickey could not ordain anyone to an office higher than his own. Apostle Hickey did hold authority to ordain Wingfield Watson a High Priest; and, according to others associated with him, it is evident that Watson was ordained a High Priest and simply given a blessing to take the watch care of the remaining Strangites. Hickey did not hold authority to ordain Watson as a Presiding High Priest over the church. It seems the idea of being ordained a Presiding High Priest was something invented by Watson some years after his ordination as High Priest. One such license was written as late as 1910. Watson was never sustained by the voice of the people as its head. At the presumed 1919 General Conference, it was resolved, “that we, the Church of Jesus Christ of Latter Day Saints in general conference assembled, do sustain this quorum as it is presently constituted, namely: Wingfield Watson, Albert Ketchum and John Flanders;” as the head of the church (General Conference Minutes, p. 2) As this was also a usurpation of the priesthood, the matter of this quorum was soon dropped. Watson ordained Joseph Hickey an Elder on June 29, 1907 . I have two ordination certificates of Joseph Hickey. One is dated June 29, 1907 ; and signed by Wingfield Watson as “Presiding Elder.” The later is dated February 19, 1918 : and signed is by Wingfield Watson as “Pres. High Priest.” When Stanley Johnson requested a copy of Joseph Hickey’s Elders License he presented the one dated 1918. It is evident that Joseph Hickey recognized Watson as a High Priest. John Hajicek’s contention has been that no one can be ordained a High Priest without the authorization of the High Council or General Conference. This does not stand in face of the law and the testimony. Utah D&C 20:67 was no longer in effect after the death of the Prophet James. Many High Priests were ordained before the addition of 20:67 in 1835; and many were ordained after the death of James J. Strang. John Hajicek is caught in a catch 22. Joseph Hickey was ordained by Wingfield Watson at the time he claimed to be a High Priest; and possibly as a Presiding High Priest. Hickey ordained Steve Barany an Elder; and he ordained John Hajicek an Elder. If Wingfield Watson was not properly ordained a High Priest, it follows the ordination of Joseph Hickey was not legitimate; as latter ordinances take precedence over former ones. Watson had been ordained an Elder by Apostle Ebenezer Page in 1858; but, had subsequently been ordained a High Priest by Wingfield Watson on April 18, 1897 . The second takes precedence. If the ordination of Wingfield Watson was not legitimate, the ordination of Steve Barany was not legitimate and the consequent ordination of John Hajicek was not legitimate. It seems that Hajicek’s primary purpose in this unfounded claim has been an attempt to dishonor others; but by doing so he has dishonored his own priesthood. A case could be made that the ordination of Watson was not legitimate because he was usurping the priesthood at the time he ordained Joseph Hickey. The Prophet James J. Strang wrote, “The Book of the Law of the Lord is the end of controversy.” (Northern Islander, Sept. 7, 1854) Neither the chapter on “Ordination” nor the chapter on “High Priests” contains any provision for ordination other than the requirement to be called through the mouth of one holding as high a priesthood through the spirit of prophecy (not the voice of man); and be ordained under the hands of one holding that priesthood. The ordinations of Apostle L. D. Hickey, Wingfield Watson, and Joseph Hickey (except Watson’s presumed ordination to the office of Presiding High Priest) appear legitimate. Verse 20:67 ended when that organization ceased to function after the death of James J. Strang in 1856. According to the writings of others that were aware of the ordination of Watson, it seems that Watson came up with the idea of being President of the church long after he was ordained a High Priest by Apostle Hickey. It seems the priesthood of John Hajicek is valid as long as he concedes the ordination of Watson to High Priest as legitimate. There is a great warning here, though. “20 Woe unto them that call evil good, and good evil; that put darkness for light, and light for darkness; that put bitter for sweet, and sweet for bitter! 21 Woe unto them that are wise in their own eyes, and prudent in their own sight!” (Isa. 5) If John continues to claim that no one could be ordained a High Priest—except under the provisions of 20:67—then he brings his own priesthood under question. Samuel E. West was born on December 10, 1938. His parents Cliffie and Stephen West were both members of the church. Stephen was a Presiding Elder of the Voree Branch when he called Samuel to the office of Elder; and approved by a vote of the Voree Branch. Samuel, for personal reasons, elected to be ordained by Lloyd Flanders, High Priest; and was ordained on July 8, 1956. In 1966, he moved to Daytona Beach, Florida; and in 1970, he moved to Shreveport, Louisiana. The Prophet James J. Strang ordained L. D. Hickey one of the Twelve Apostles. Hickey ordained Samuel Martin a High Priest, who ordained Lloyd Flanders a High Priest, who ordained Samuel E. West an Elder. The Prophet James wrote in The Diamond that “authority is good till regularly taken away.” (p. 15) No such action has ever been taken against his priesthood. Through the ministry of Mr. West there have been many other Elders called and ordained from Virginia to Hawaii; and from Zion to Africa . Mr. West takes no credit for this work; as everything he has done is included in his duties and all of the work that is realized is through the hand of God. One Elder in Kenya was a nationally recognized Pastor of an Assembly of God Church. Through him the gospel has spread through many towns and cities; and to Uganda, Botswana, and Djibouti. Members of this organization live in Africa, Israel, Virginia, Tennessee, Louisiana, Texas, Hawaii, and Canada. Mr. West has recovered most of the original works of the church under the Prophet James to digital format and printed hard copies for distribution. They are available on the Mormon Books Page. He is always eager to answer any questions which are earnest desires for spiritual truth.